What are your return & replacement policies? Additionally, we offer guaranteed shipping times for those customers who absolutely have to have a guaranteed arrival date. Please inquire with our sales or shipping department for the surcharge on this service. Our 40W/45W Muse and Hobby lasers have a 100% money back guarantee (minus shipping and handling) if you return your unit in like new condition within 30 days (main unit only, excludes optional accessories). If for some reason a part is damaged in transit we will be happy to send out a replacement part immediately free of charge. We will happily replace defective parts on dead on arrival (DOA) parts with complimentary shipping (except machines sold FOB Las Vegas) but we do not refund shipping charges on return for refund units (includes defective on arrival parts/units). 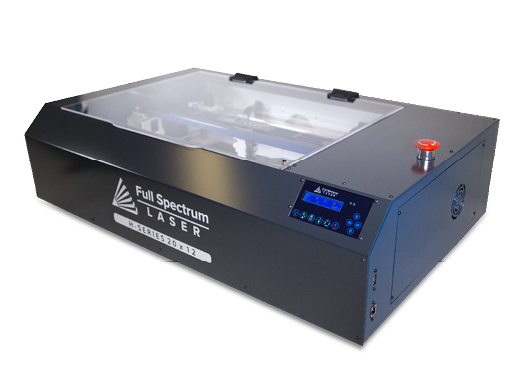 Due to their large size and effort in crating, our Professional and LF Series lasers have a 20% restocking fee + shipping fee for returns if returned within 30 days in new condition. As always any parts damaged in transit will be replaced immediately. All optional accessories including optional extra lenses, beam combiners, air purifiers, rotary attachments have a 20% restocking fee unless otherwise noted in writing. Units picked up or shipped on a customer's shipping account are considered sold FOB Las Vegas and excluded from complimentary shipping. Any replacement parts or returns are made available for pickup or shipped on a customer's shipping account or charged for shipping when sold FOB Las Vegas. All return for refunds require an RMA number and shipping charges are the responsibility of the purchaser (includes defective on arrival parts/units). Listed return and replacement policies apply only to purchases made directly from Full Spectrum Laser and apply only to the original purchaser. Purchases made by 3rd parties including 3rd party leasing companies may have their own set of terms and conditions - please contact the 3rd party vendor directly for any inquiries. To obtain an RMA Number and start the RMA Process, please contact support. Our contact information can be found here.